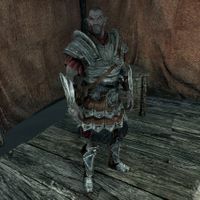 Legate Sevan Telendas is a Dunmer soldier and the field commander of Winterhold Imperial Camp. He can be found either in his tent, or planning the war effort in a tent with a map of Skyrim. Should the Legion claim Winterhold, he can be found in the Winterhold Jarl's Longhouse. Sevan is clad in a set of Imperial heavy armor. This includes an Imperial armor, a pair of Imperial bracers, and a pair of Imperial boots. He is equipped with an Imperial sword for close-range combat, and uses an Imperial bow supplemented with 13 steel arrows when the need arises. He also carries a steel dagger. This page was last modified on 30 December 2013, at 13:24.